Huge! In fact it’s even bigger than Paris; 9 times bigger! Berlin is made up of 12 administrative districts, each with its own unique style, which means that there are many different ‘downtown’ areas to the city. There are 3.4 million within its city limits. Located in northeastern Germany, it is the centre of the Berlin-Brandenburg metropolitan area, comprising 5 million people from over 180 nations. You’ll be spending the Euro and speaking German (although English is the most common second language). 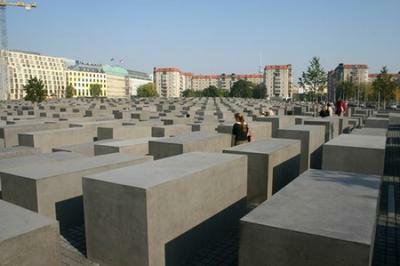 What is Berlins best known tourist attraction? 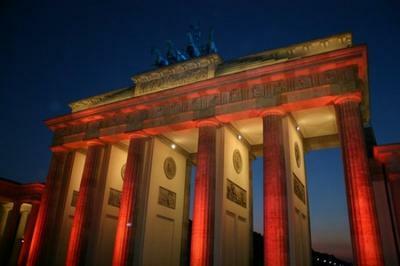 This would be The Brandenburg Gate which is the only remaining city gate and probably the city’s most famous symbol. 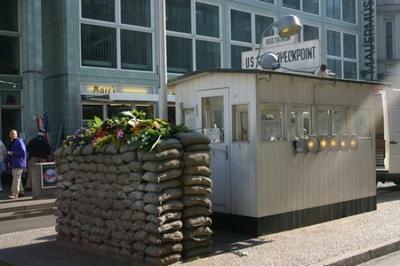 The gate now acts to symbolize reunification between the East and West of Berlin after dividing them for decades. A walk around the borough of Mitte – and in particular down Unter den Linden (Berlins Champs Elysees) - should use up at least a roll of film (or memory card). The main attractions here are: The Reichstag – Opened originally in 1894 to house the German Parliament it was completely gutted by fire in 1933 only to re-open in 1999 after a reconstruction headed by the renowned architect Norman Foster. Today it houses the Bundestag, the present day word for German Parliament. 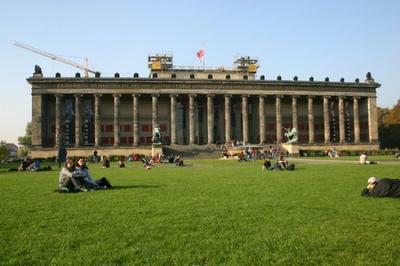 Museum Island – Known locally as Museumsinsel. As you might have guessed this is an island full of museums such as the Old Musem (Altes Museum), New Museum (Neues Museum) and the Old National Gallery (Alte Nationalgalerie). The island also houses the impressive Berlin Cathedral. 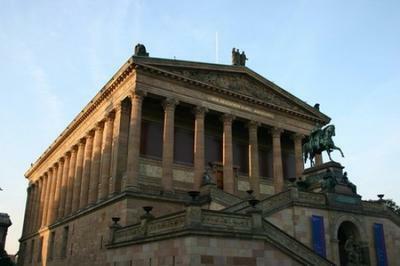 Museums are a huge attraction in Berlin and the whole city has 175 of them which range from important art collections in the Gemäldegalerie to sugar in the Sugar Museum! 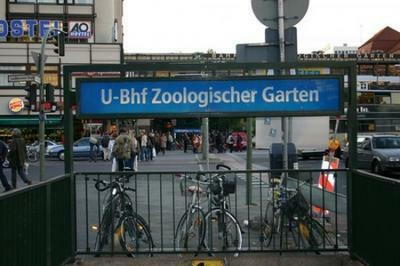 Outside of Mitte there is still plenty to do such as a day at Berlin Zoo. Home to the largest range of species in the world and a celebrity polar bear named Knut, the zoo is like an oasis in the city and is very popular with families looking for a day out. A little further from the centre of the city is The Olympic Stadium which hosted the 2006 World Cup Final. Hertha Berlin, Berlin´s biggest professional football team, plays there during the Bundesliga season. What about the Berlin wall? Where is the best place to see it? 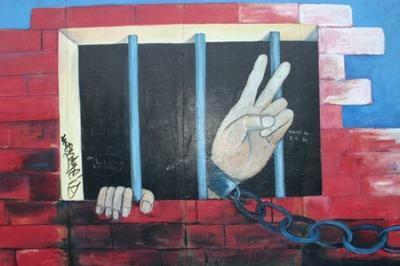 Different parts throughout the city but East Side Gallery is best place to see it. This gallery is also the longest remaining part of the Berlin Wall and was painted with 101 works by 118 artists from 21 countries. Most of what’s to see is in East Berlin, but you should go over to West Berlin at least once. 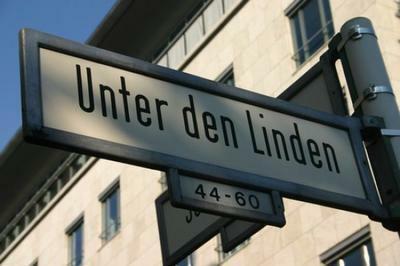 The easiest way to get there is via bus #100 or #200 from Unter den Linden. If you’re looking to chill out then you should check out the Tiergarten. 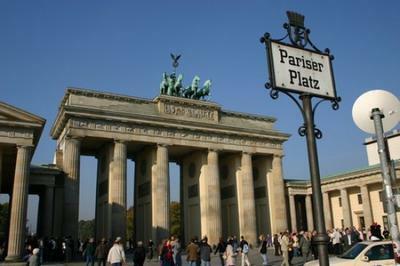 And for free walking tours go to the Starbucks across from the Brandenburg Gate at 11am, 1pm and 4pm. No catch – just make sure to tip! If you’re looking for a different perspective on seeing Berlin then why not take advantage of the 180km of waterways meandering through the city by taking a short ferry ride. If you want to avoid the water don’t worry, Berlin has more bridges than Venice - at last count that was about 1,700! Don’t think that this huge sprawling city is just a big grey mass of concrete, in fact this couldn’t be further from the truth. 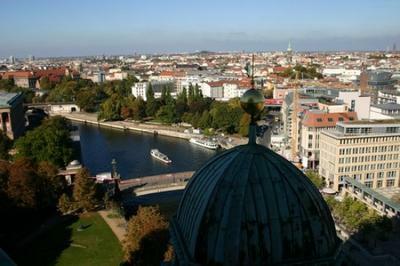 Berlin is Germanys greenest metropolis, with over 30% of its area covered with parks, woods, lakes and rivers. Where can you find most of Berlin’s bars? If you could pinpoint one strip, it would be Oranienburgerstrasse in East Berlin which is lined with bars. There’s a neighbourhood called Prenzlauer Berg that also has lots of bars. Rumours are true. Berlin is the cultural centre of Germany and its nightlife reflects this with countless bars, lounges and clubs dotted around the city. Things don’t get going here until 1am and keep on going well into the next day. Any bars or clubs worth singling out? Cafe Zapata (Oranienburger Str. 54-55) may not look like the most welcoming of places from the exterior but this bar, which was formerly marked for demolition, has a great atmosphere thanks in no small part to it’s industrial ‘décor’. Aufsturz (Oranienburger Str. 67, Mitte) is another great bar on the same street which, unlike a lot of Berlins hip, themed bars, is a traditional German establishment which is popular with locals. There’s a great selection of beers to choose from and some pretty decent food. When it’s time for you to hit the tiles you could try your hand at getting into Berghain (Am Wriezener Bahnhof), one of the worlds most famous clubs. The only problem you might have is the extremely strict entrance policy. This huge former power plant is a place where anything goes once you’re inside, and getting in usually only starts at about 5am! Watergate (Falckensteinstr. 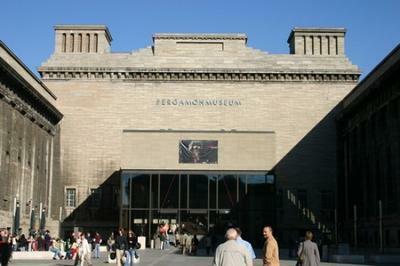 49) has one of the best locations for any club in Berlin and a rather impressive glass front which overlooks the Spree. Once inside you’ll be blown away with the music and lighting system! Berlin has its own genuine beer specialty called Berliner Weiße. It's a bubbly, bitter beer made from wheat and then fermented in the bottle. With a shot of raspberry or Waldmeister syrup, it is served as “Weiße mit Schuss” – a refreshing summer beverage. Is there anything to do which is not alcohol related? If you don’t mind mingling with high society you can attend one of Berlin’s three (yes, three) opera houses. There are also 130 theatres and venues which cover all types of entertainment. Is it expensive to eat out in Berlin? Not at all. Obviously in touristy areas such as around Unter den Linden in the middle of Mitte it’s expensive but in less touristy areas eating out is cheap. As you’d expect, all cuisines are well represented. Berlins’ cuisine is quite diverse thanks to its Middle Eastern and Southeast Asian populations. Make sure to check out some of the open air markets! Berlin’s oldest dining establishment is Zur letzten Instanz (Waisenstr. 14-16) which has been open for business for 400 years! If you want to sit down you need to be there by 11pm. Fast-food places selling kebabs and the like open well into the early hours. Imbiss Currywurst stands are an institution; they sell sausages with curry sauce, which must be tried. The most famous one of all is under Eberswalder Str U-Bahn Station. Be careful eating in and around Mitte (the most central borough of Berlin) as prices do tend to be inflated and aimed purely at tourists. How many different modes of public transport are there in Berlin? There are three main type of transport – train, tram and bus. The train lines run both overground (S-Bahn) and underground (U-Bahn) and the tram operates mainly in the eastern part of the city. There is also a highly developed bicycle lane system in operation and you’re allowed to carry your bike onto both the S and U-Bahn. You will probably only need to use these trains but bus #100 and #200 are handy for getting from East to West Berlin. Definitely. All of the different modes use a common ticket that is priced according to a zone system, although you probably won’t go outside zones A and B, and will cost €2.10. If you think you’re going to be on the move a lot buy a day card (Tageskarte) for €6.10.